Background and objectives Staphylococcus infection–associated GN (SAGN) is a well recognized disease entity, particularly because of the frequent IgA-dominant glomerular immunoglobulin staining on kidney biopsy. Biopsy features can resemble two other disease entities – primary IgA nephropathy and Henoch-Schönlein purpura nephritis – posing a diagnostic pitfall. This is clinically relevant because of the crucial difference in the therapeutic approach. The diagnosis of SAGN is further complicated by the variability in the degree of glomerular IgA (and C3) staining, the extent of electron dense immune-type deposits, and positive ANCA serology in some patients. Design, setting, participants, & measurements We performed a thorough histopathologic review of our single-center cohort of 78 culture-proven SAGN biopsies to assess the spectrum of IgA staining, prevalence of ANCA serology, prevalence of subepithelial “humps,” and other histologic features to distinguish from primary IgA nephropathy. Results Among the 78 SAGN biopsies, IgA staining was trace in 25%, mild in 19%, moderate in 44%, and strong in 12% of the cases. C3 was frequently moderate-to-strong but was trace in 14% of the biopsies. Concomitantly trace IgA, IgG, and C3 (pauci-immune pattern) was seen in 13%. Crescents were present in 35% of the SAGN biopsies. Out of 41 patients tested for ANCA, nine (22%) were positive, including patients with endocarditis and other infections. Subepithelial humps were identified in only 31% of the SAGN biopsies. Conclusions SAGN biopsies show marked variability in IgA immunofluorescence staining and low frequency of subepithelial humps compared with poststreptococcal GN. Occasional ANCA positivity is present in cases of SAGN, even in infections other than endocarditis. Therefore, biopsy diagnosis can be difficult particularly when clinical symptoms of infection are subtle. Both the pathologist and the nephrologist should be aware of these diagnostic pitfalls. Staphylococcus infection–associated GN (SAGN) is seen with increasing frequency in the practice of renal pathology (1–12). It usually presents with AKI, recent onset proteinuria (frequently nephrotic-range), microscopic hematuria, and sometimes purpuric skin rash. Most patients are elderly (>50 years) but younger persons are also affected. Intravenous drug use is a common predisposing factor in the younger patient population (frequently resulting in endocarditis-associated GN). The typical renal biopsy findings are that of active GN with mesangial and/or endocapillary hypercellularity, with or without crescents accompanied by acute tubular necrosis (ATN) and red blood cell casts. Glomerular IgA and C3 (codominant) staining by direct immunofluorescence is commonly seen and is an important diagnostic feature. 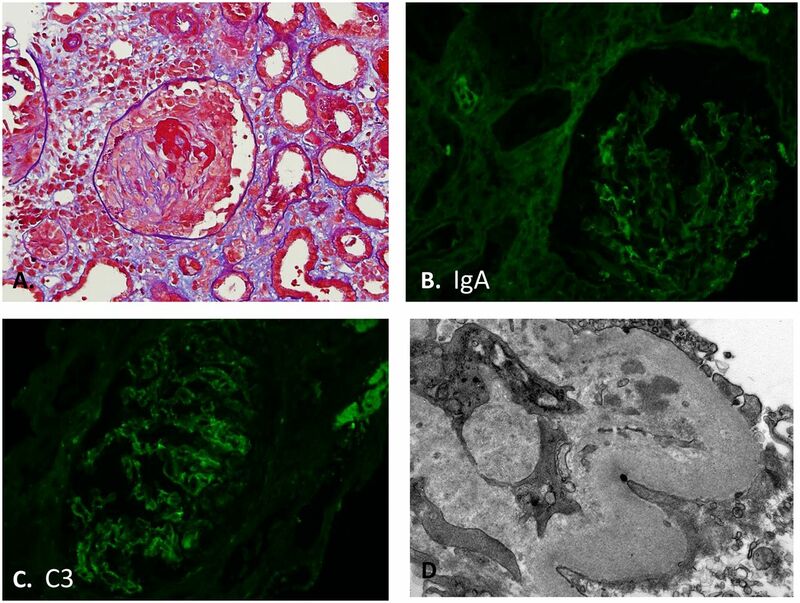 SAGN has often been termed “IgA-dominant” infection-associated GN and the IgA staining is used as a distinguishing histologic feature from poststreptococcal and other infection-associated glomerulonephritides (1–11). On the other hand, this IgA staining can be a potential diagnostic pitfall because of similar staining seen in idiopathic IgA nephropathy (IgAN) (7,11), and Henoch-Schönlein purpura nephritis, also called IgA vasculitis (13–19). However, we have encountered biopsies of SAGN in which IgA staining is not so strong as previously described, or may even be absent. Boils et al. (20) recently reported IgA staining in only 29% of a total of 49 cases of endocarditis-associated GN (53% of which were staphylococcal endocarditis). They also demonstrated positive ANCA serology in 28% of their cases. Presence of ANCA has been previously reported in 18%–33% of patients with infective endocarditis (21–26). A recent prospective study by Langlois et al. (27) on 50 consecutive patients with infective endocarditis found 12 (24%) to be ANCA positive. Thus, ANCA vasculitis also enters the differential diagnosis, especially for staphylococcal endocarditis. Misdiagnosis and treatment of SAGN as ANCA vasculitis can be detrimental for the patient (28–31). Considering these evolving developments, we systematically reviewed the biopsy findings and ANCA serology results in our cohort of 78 patients with culture-proven SAGN. The aims were to assess the variability in IgA (and C3) staining, prevalence of subepithelial “humps,” and also the incidence of positive ANCA serology in SAGN. We also assessed the overall spectrum of IgA and C3 staining in primary IgAN biopsies to highlight subtle differences from SAGN. An overview of additional disease entities that must be considered in the differential diagnosis of SAGN and histologic clues to distinguish between them are provided. Renal biopsies were processed using standard techniques for light microscopy, direct immunofluorescence, and electron microscopy. By retrospective review, we identified native kidney biopsies from our records that were diagnosed as SAGN. We only included biopsies from patients that had culture-proven Staphylococcus infection, either on blood culture or local wound culture, or both. A database of these cases had been maintained (7,13) and new cases were added as received. There were 30 cases in which the biopsy findings were strongly suggestive of infection-associated GN, but cultures were either negative or not available. These cases were not included in this study. Slides and reports were retrieved and reviewed. For the purpose of this study, the cases were grouped by site of infection: (1) endocarditis, (2) bacteremia of unclear source, (3) infected skin ulcers, (4) osteomyelitis and septic arthritis, (5) pneumonia, and (6) others (which included patients with visceral abscess, multiple infected sites as in motor vehicle trauma, patients with postsurgical infection, and infection of abdominal mesh for hernia repair). Group 2 (bacteremia of unclear source), included patients in whom the underlying source of infection was not known, but who had staphylococcal bacteremia. Some of these patients may have had endocarditis but the valvular vegetations could not be demonstrated on echocardiogram. Also, patients with postsurgical bacteremia and patients with infected indwelling catheters were included in this category. Our study cohort consists of adult patients. At our center we have relatively few pediatric kidney biopsies and none of them showed features of SAGN. This clinico-pathologic study was approved by the Ohio State University Internal Review Board (IRB 2011H0364). All our kidney biopsy reports contain a detailed description of the light microscopic, immunofluorescence, and ultrastructural findings. For glomerulonephritides, we evaluate for mesangial and endocapillary hypercellularity, extent of glomerular crescents and necrotizing lesions, extent of glomerular sclerosis (global and focal) ATN, interstitial inflammation, red blood cell casts, interstitial fibrosis, tubular trophy, and condition of the vasculature. On immunofluorescence study, we routinely grade the intensity of staining (0 as negative, 1+ as mild, 2+ as moderate, 3+ as strong, and “trace” if the intensity is between 0 and 1+ or if staining is very scant in distribution), and assess the distribution of staining – mesangial, capillary wall, or both, diffuse versus focal. For ultrastructural examination, on average, we examine two glomeruli per biopsy. We assess for the presence/absence, extent, and distribution pattern of electron dense immune-type deposits. For this study, we also examined 100 consecutive biopsies of primary IgAN, received in our practice between 2011 and 2014, to compare, because this is an important differential diagnostic consideration encountered by pathologists. ANCA testing was performed as per routine protocol including indirect immunofluorescence staining of fixed neutrophils for detection of ANCA, and ELISA testing for antigen specificity. From January of 2004 to April of 2016, out of 9500 native kidney biopsies received in our routine renal pathology practice at the Ohio State University Wexner Medical Center, we identified 78 (0.8%) biopsies with SAGN. Their demographic and clinico-pathologic characteristics are shown in Table 1. All patients had documented culture-proven Staphylococcus infection. Methicillin-resistant and methicillin-sensitive Staphylococcus aureus (MRSA and MSSA) were the most common. Of these 78 patients, 71 patients had pure staphylococcal infections. The remaining seven patients had multibacterial infection (other bacteria along with Staphylococcus, commonly Pseudomonas). The vast majority of the patients were white men (men/women ratio was 3.5:1). Average age was 55±12 years. 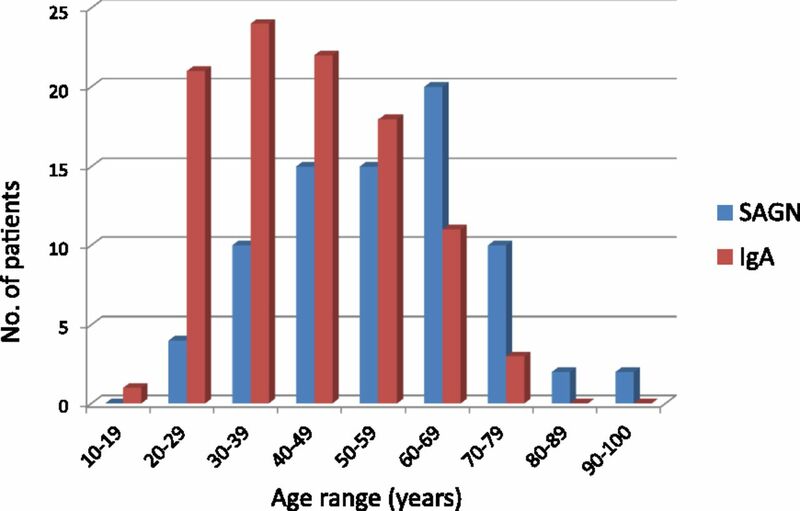 Comparing age at biopsy for SAGN and primary IgAN, SAGN more frequently presents in the older population (above age 50) and IgAN characteristically presents at a younger age, but we did find age overlap between them (Figure 1). Blood cultures were positive in 50% (39 of 78) and local wound cultures were positive in 55% (43 of 78) of the patients with SAGN. Purpuric skin rash was seen in 16 of 78 patients (20%). Low serum C3 and C4 was seen in 30% (19 of 64) and 14% (nine of 64) of the patients, respectively. Nephrotic range proteinuria was present in 48% (35 of 73) of the patients. In five patients, it was not possible to assess the degree of proteinuria because the patients were oligoanuric. Diabetes mellitus was present in 41% (32 of 78) of the SAGN patients. Infected leg ulcers and osteomyelitis were the most common sites of infection among the diabetic patients (Table 2). Nodular mesangial expansion (diabetic glomerulosclerosis lesions) were seen in 16 of the 32 biopsies from patients with diabetes mellitus. Also, 22 of 78 patients were positive for hepatitis C, mainly intravenous drug users. Age overlap among patients with SAGN and IgA nephropathy. Comparison of patient age at the time of biopsy for the 78 cases of SAGN and 100 consecutive biopsies of primary IgA nephropathy, received during an overlapping time period. The peak incidence of SAGN (60–69 years) differs from that of IgA nephropathy (30–39 years), however even younger patients are affected with SAGN, causing considerable overlap. SAGN, Staphylococcus infection–associated GN. Histopathologic features in SAGN and primary IgAN and statistical differences are shown in Table 2. Mesangial hypercellularity was commonly seen in both SAGN and primary IgAN (1). Endocapillary hypercellularity was significantly more frequent in SAGN biopsies (60%) in comparison to IgAN biopsies (10%). Crescents were seen in 27 of 78 (35%) of the SAGN biopsies and in 20 of 100 (20%) of the primary IgAN biopsies. Only two of the SAGN biopsies showed focal adhesions/segmental glomerular scarring lesions, which may represent fibrous crescents. Definite FSGS pattern was not identified in SAGN biopsies, but it is quite common in primary IgAN (49 of 100 biopsies). Table 2 also shows the number of biopsies with diabetic nodular mesangial expansion. Other features including ATN and small scattered tubular red blood cell casts are common in SAGN. Interstitial inflammation was also usually present but tends to be mild-to-moderate and patchy in distribution. On electron microscopic examination, mesangial deposits are frequently seen in both SAGN and IgAN. Capillary wall deposits were present in 50 of 78 SAGN biopsies (64%) and 32 of 100 IgAN biopsies (32%). Only 24 out of 78 SAGN biopsies (31%) showed subepithelial humps. When present, they varied from few to several. Subepithelial humps were not seen in primary IgAN. Immunofluorescence staining for IgG, IgA, and C3 in the SAGN and IgAN biopsies is shown in Table 3. The IgA staining intensity tends to be mild-to-moderate (1+ to 2+) and C3 tends to be moderate-to-strong (2+ to 3+) in the majority of the SAGN biopsies but, clearly, there is a spectrum in the intensity of IgA positivity. In primary IgAN biopsies, staining for IgA is more frequently moderate-to-strong (2+ to 3+), whereas C3 staining is mild-to-moderate (1+ to 2+). Staining for the immunoreactants was diffuse in both diseases (involving all of the glomeruli in the biopsy). Mesangial staining predominates in both, but segmental capillary loop staining was seen in 32 of 78 SAGN biopsies (41%) and 20 of 100 primary IgAN biopsies (20%). The staining can be segmental or global and the number of deposits may vary from one mesangial area to another in SAGN. In primary IgAN biopsies also, staining may involve all of the mesangial areas (global) or just some (segmental). Immunofluorescence staining intensity for IgG, IgA, and C3 in SAGN and IgAN biopsies. SAGN biopsies that had trace or negative staining for the immunoreactants IgA, IgG, and C3 either individually or concomitantly are shown in Table 4. If all three immunoreactants showed concomitant trace staining in the biopsy, we labeled such cases as having a “pauci-immune pattern.” Electron microscopy showed few electron dense deposits in these biopsies. Trace staining for IgA was seen in 25% (20 of 78) of the biopsies (Figures 2 and 3). Trace C3 staining was seen in 14% (11 of 78) of the biopsies. Pauci-immune pattern was seen in ten of 78 biopsies (13%). Six of these ten pauci-immune biopsies also had crescents. One patient had all three features – focal crescents, positive ANCA serology, and a pauci-immune pattern on immunofluorescence staining and ultrastructural examination (depicted in Figure 2, case 1 in Table 5). Crescents and pauci-immune pattern in biopsy with SAGN. Patient 1 from Table 5, a twenty-two-year-old white man, intravenous drug user with tricuspid valve endocarditis, methicillin-resistant Staphylococcus aureus bacteremia, and cytoplasmic ANCA positivity showing “pauci-immune pattern” on the biopsy with concomitantly trace IgA, IgG, and C3. (A) Focal crescents (Periodic acid Schiff-trichrome stain; original magnification, ×400). (B) Trace IgA staining (original magnification, ×400). (C) Trace C3 staining (original magnification, ×400). (D) Few small paramesangial electron dense immune-type deposits. No subepithelial humps seen (uranyl acetate and lead citrate fixation; original magnification, ×25,000). Crescents with trace IgA but moderate C3 in biopsy with SAGN. Patient 2 from Table 5, a fifty-seven-year-old white man who had undergone aortic valve replacement, ascending aorta aneurysm repair, admitted to intensive care unit with acute respiratory failure, diffuse alveolar hemorrhage, ARF, cytoplasmic ANCA positive (anti–proteinase-3 1:40). (A) Crescent formation (Periodic acid Schiff-trichrome stain; original magnification, ×400). (B) Trace IgA staining (original magnification, ×400). (C) Moderate (2+) C3 staining (original magnification, ×400). (D) Rare small paramesangial electron dense immune-type deposits (uranyl acetate and lead citrate fixation; original magnification, ×25,000). Positive ANCA serology was present in nine out of the 41 patients tested (22%), shown in Table 1. Clinico-pathologic features and renal outcomes of these nine patients are shown in Table 5. Four patients were positive for cytoplasmic ANCA (C-ANCA), three were positive for perinuclear ANCA (P-ANCA), and two were negative for both P-ANCA and C-ANCA (by indirect immunofluorescence, but both were positive for anti–proteinase 3 [PR3] by ELISA). ELISA testing was performed on eight of the nine patients. Anti-PR3 was present in five patients. In the remaining three patients, ELISA was negative despite positive C-ANCA (n=2) and P-ANCA (n=1) by immunofluorescence testing. ELISA testing for myeloperoxidase was negative in all. All patients were treated with appropriate antibiotics. Five patients did show recovery of renal function. Four patients remained on dialysis. Patient 2 and patient 9 (Table 5) also had pulmonary hemorrhage. Patient 2 was actually started on corticosteroids and plasmapheresis and transferred to our hospital. When initial blood cultures showed Staphylococcus epidermidis, this was thought to be due to a contaminant. However, repeat blood cultures showed methicillin-sensitive Staphylococcus epidermidis in four culture sets. The patient developed hemoptysis. He also had severe bone marrow suppression and pancytopenia. Bronchoscopy did reveal blood in the lungs and an endobronchial biopsy had to be performed but it did not show vasculitis. The bleeding was probably because of severe bone marrow suppression and pancytopenia. Corticosteroids were stopped and antibiotics were started, but the patient died within 2 weeks of the biopsy. Biopsy showed focal crescents and absent IgA but strong C3 staining (Figure 3). Patient 9 in Table 5 had MRSA bacteremia for 3 months before the biopsy and was treated with multiple courses of vancomycin. She required drainage of her psoas abscess and debridement of her spinal osteomyelitis. Endocarditis was excluded on transesophageal echocardiography. Subsequently, she had increasing C-ANCA titers from 1:20 to 1:80, and developed pulmonary hemorrhage and gross hematuria. Therefore, she was treated with corticosteroids and six sessions of plasmapheresis just before the biopsy. Clinically, she improved and pulmonary hemorrhage stopped, however, she remained on dialysis until the last follow-up which was 4 months after discharge. Under the general pathologic schema of glomerular diseases, SAGN is classified under the category of “immune-complex GN” (32), because of the IgA and C3 dominant immune complex deposits in the glomeruli. 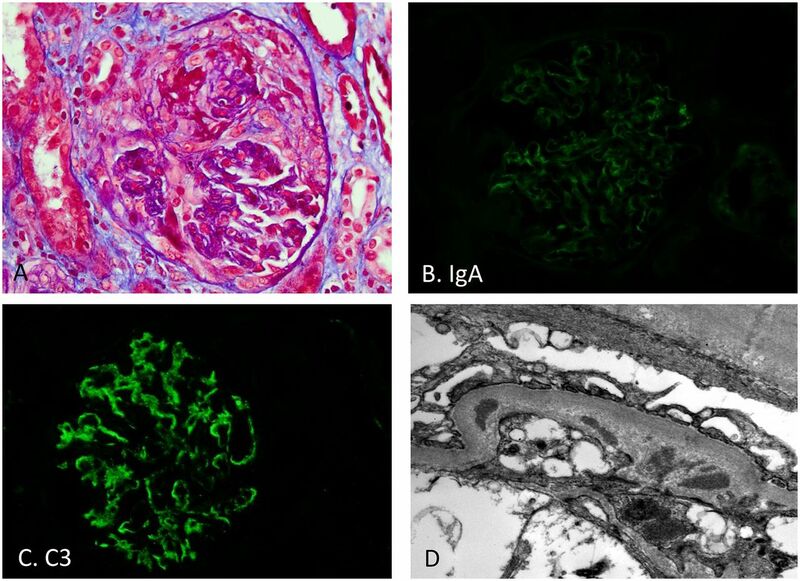 Glomerular IgA staining has been illustrated very strongly in most published reports of SAGN. However, we find that IgA staining in SAGN can show a wide spectrum. It varies from trace or negative to strong, with the majority of the biopsies showing 1 to 2+ (mild-to-moderate) staining, in contrast to moderate-to-strong staining seen in IgAN biopsies. On the other hand, C C3 staining tends to be more prominent in SAGN than in IgAN. So, moderate-to-strong C3 staining is usually a helpful diagnostic feature in SAGN, especially when the IgA staining is trace. However, 14% of the biopsies in our SAGN cohort showed trace or negative C3. In fact, ten out of 78 SAGN biopsies (13%) showed concomitant trace staining for all three immunoreactants (IgA, IgG, and C3). So, a small subset of SAGN biopsies show a “pauci-immune” pattern. Also, endocapillary hypercellularity is significantly more common in SAGN as compared with primary IgAN, and the reverse is true for FSGS pattern of injury, suggesting that SAGN is more of an acute disease process whereas primary IgAN is usually a protracted chronic disease. FSGS lesions in IgAN are even important in prognosis according to the Oxford Classification (33,34). The term “pauci-immune” is used in the context of ANCA-associated crescentic glomerulonephritides (granulomatosis with polyangitis, eosinophilic granulomatosis with polyangitis, and microscopic polyangitis) because they show trace-to-negative glomerular immune complex deposits on the biopsy. Also, these are classified as crescentic glomerulonephritides because presence of crescents (focal or diffuse) is the most important diagnostic feature (along with positive ANCA serology directed against neutrophil cytoplasmic antigens – PR3 or myeloperoxidase). However focal crescents can occur in other glomerulonephritides as well. In our cohort, up to 35% of the SAGN biopsies showed focal crescents and 22% of patients had positive ANCA serology. In fact, one patient from our cohort demonstrated all three features in the biopsy – presence of crescents, pauci-immune staining pattern, and positive ANCA serology (case depicted in Figure 2). Thus, this is an important pitfall in the diagnosis of SAGN. A subtle histologic clue is that SAGN biopsies usually show active cellular crescents. Fibrous crescents were rarely seen. In true ANCA-associated GN we frequently see concomitant presence of fibrous, fibrocellular, and cellular crescents (crescents of different ages). Presence of vasculitis also favors true ANCA-associated GN (Table 6). Immediate immunosuppressive treatment is needed in active ANCA-associated GN (35), but is best avoided in acute phases of SAGN. If renal dysfunction persists after infection is cleared, and the biopsy shows active crescents and ANCA positivity, then a trial of corticosteroids may be recommended but is still a controversial issue (13,17,18). Boils et al. (20) recently reported presence of ANCA positivity in a subset of patients with endocarditis-associated GN. Our study shows that not only endocarditis, but even staphylococcal infections involving other organ systems, can be associated with positive ANCA serology. The pathogenesis of ANCA antibodies in infection has only been speculated on and includes immune dysfunction in response to microbial peptides, upregulation of autoantigen genes, and molecular mimicry between microbial antigens and autoantigens (36–38). The primary defense against Staphylococcus aureus infection is the innate immunity provided by neutrophils. It is now evident that Staphylococcus aureus can block neutrophil migration, diapedesis, recognition, and phagocytosis. The bacterium can effectively survive inside the phagolysosome by neutralizing antimicrobial peptides inside the phagosome. It can also secrete numerous cytolytic toxins that can destroy neutrophils and other immune cells (39–41). One can hypothesize that the massive destruction of neutrophils in staphylococcal sepsis can potentially lead to exposure of sequestered neutrophil antigens and development of ANCA. At the present time it is not possible to conclude that staphylococcal infection by itself is responsible for the glomerular injury in these patients and the ANCA antibodies are solely a by-product of neutrophil destruction. As demonstrated by Jennette and Falk (42,43), ANCA antibodies may themselves be pathogenic so these may contribute to or exacerbate the glomerular injury that was initiated by infection. This may lead to a variable response to antibiotic treatment as seen in patient 9 shown in Table 5. Although one can argue that some of these may be false positive ANCA results, still these cannot be ignored. They may represent atypical ANCAs directed to as yet unknown antigenic specificity (44,45). ANCAs have also been reported in association with other conditions like connective tissue diseases, inflammatory bowel disease, malignancies, and drug-induced vasculitis (35). Drugs including antithyroid drug propylthiouracil, sulfasalazine, D-penicillamine, minocycline, antihypertensive medication hydralazine, “biologic” agents like inhibitors of TNF-α (TNF-α blockers like adalimumab, infliximab, etanercept), and levamisole adulterated cocaine have also been implicated in development of ANCAs (46), but that was not the case in any of these nine patients in our cohort. Our study emphasizes that in addition to IgA nephropathy and Henoch-Schönlein purpura nephritis, ANCA-associated GN can also enter the differential diagnosis of SAGN (47). An additional confounding factor relevant to the differential diagnosis is that 2%–3% of healthy patients (living kidney donors) show trace-to-moderate incidental glomerular IgA staining (48). In Asian countries, the incidence is substantially higher. Thus, it is possible, although infrequently, to have coincidental mild IgA staining even in biopsies that otherwise show pauci-immune ANCA-associated crescentic and necrotizing GN. One should be aware not to erroneously conclude this to represent infection-associated GN (see Table 6). A subepithelial “hump” is defined as a large dome-shaped electron-dense deposit between the glomerular basement membrane and the visceral epithelial cells (podocytes) (49). Presence of numerous subepithelial humps is considered to be a “hallmark lesion” of poststreptococcal GN (1). Subepithelial humps have been described in SAGN as well and reported in as high as 70% of the biopsies (12). Therefore, poststreptococcal GN also enters the differential diagnosis of SAGN. An interesting finding in our study was the much lower prevalence of subepithelial “humps” in SAGN biopsies than previously reported. We found subepithelial “humps” in only 31% of our SAGN biopsies. There may be many reasons for this discrepancy. Small subepithelial deposits with even mild outward bulge of the glomerular basement membrane may have been erroneously labeled as a “subepithelial hump” in some reports, just because of the mental bias that humps are typically seen in “postinfectious/poststreptococcal” GN and therefore should also be seen in SAGN because both are triggered by infection. In fact, SAGN is often lumped under the category of “postinfectious GN,” which is incorrect (50). We do not consider such small subepithelial deposits as “humps.” Also, occasional electron dense deposits in the glomerular capillary groove overlying the mesangium between two adjacent capillary folds may give the visual impression of subepithelial “hump.” In some instances they may be, but not always (1). In our experience, true “humps” are not so common in SAGN and their absence does not preclude the diagnosis. Also, subepithelial humps are not pathognomonic of any condition because they can be seen even in other glomerular diseases like C3 GN, dense deposit disease (51,52). C3 GN (because of strong C3 staining and occasional humps) and sometimes cryoglobulinemic GN can also potentially be confused with SAGN on biopsy. Few histologic differences are highlighted in Table 6 but the reader can refer to other detailed reviews on these entities. In conclusion, SAGN biopsies show marked variability in IgA staining, occasionally positive ANCA serology, and low prevalence of subepithelial humps. It can be a difficult diagnosis both for the pathologist as well as the treating nephrologist because of this and other confounding features like subtle clinical signs of infection, variable duration between infection and GN, and occasional presentation with purpuric skin rash. Infection needs to be appropriately treated and inadvertent immunosuppressive therapy avoided. We acknowledge Dr. Nilesh Mhaskar, Dr. Zeid Khitan, Dr. Parikshit Thakur, Dr. Anthony Alvarado, and Dr. Samer Mohandes for the detailed clinical information on their patients, and Jianying Zhang for statistical analysis. : Henoch-Schönlein purpura-like presentation in IgA-dominant Staphylococcus infection-associated glomerulonephritis-a diagnostic pitfall. Clin Nephrol 79: 302–312, 2013.